What to do with a naughty cockerel. Meet Bwian, my bantam cockerel, and thank goodness he is a bantam as Lord knows how I'd handle him if he was any bigger. He was in such a grump this morning as I was cleaning out the hen house, and he was giving one of his girls an extremely hard time whilst coming back to give me the occasional peck on my boot. Needless to say I just had to stop what I was doing and cuddle him, yes that's right cuddle him ha. 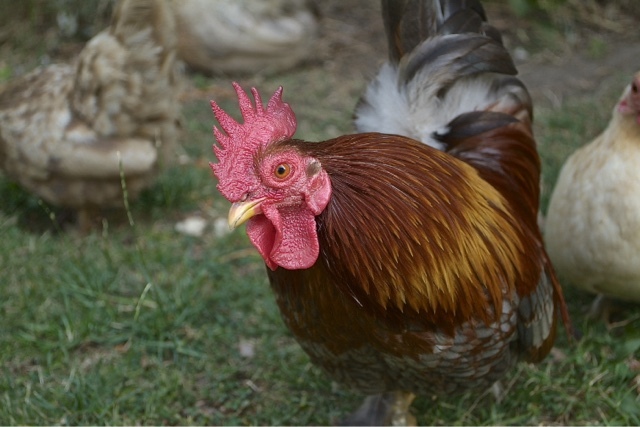 Squaring up to a cockerel simply doesn't work, they are always ready for a fight. The only way to deal with this behaviour is a quick movement (with gloves on) to pick them up, then hold them against you with their wings secure, this demeans them and they soon realise who is boss! Now unfortunately for Bwian I was in an extra hurry this morning and simply did not have time to stand and cuddle him, so he had to do time in the pantry! Needs must... I have to say I think the 5 mins time out helped massively, and he walked out muttering apologies to me and his girls!